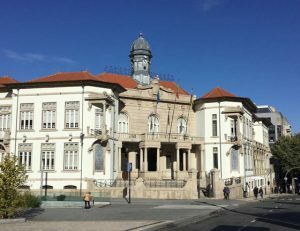 The fourth day of our Footprint tour in Portugal reached Vila Nova de Gaia today, where the official launch of the Footprint and biocapacity analysis for the municipality took place at the Town Hall. The meeting – attended by nearly 40 people from the municipality administration, local service providers, students, representatives of the civil society and the local media – was opened by Arch. 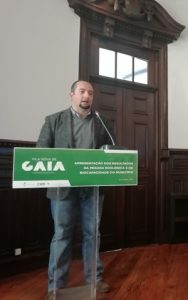 Valentim Miranda, local councilor for the environment. Arch. 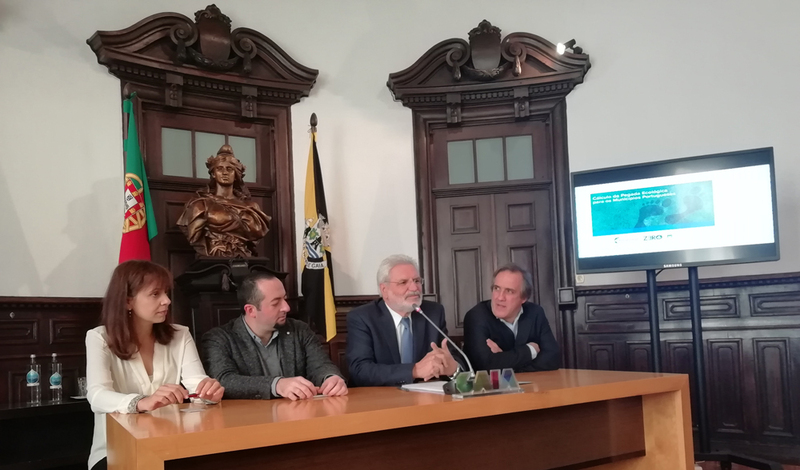 Miranda praised the involvement of Vila Nova de Gaia and commended the city’s mayor, Eduardo Vítor Rodrigues, for his decision to embark on the project. He also stressed the importance of innovation as well as the need to educate people on environmental issues in order to protect our environment. Following Arch. Miranda speech, Paulo Magalhães, city Footprinting project coordinator at ZERO, and Alessandro Galli, Global Footprint Network’s director of the Mediterranean program (pictured right), gave their presentations, both stressing the importance of cities as sustainability actors. Ecological Footprint is 3.92 global hectares (gha) per person, 0.4% lower than the national average. Food represents the largest share (31%) of the Ecological Footprint with a value of 1.1 gha per person, followed by the transportation sector (21%). Referring to a previous study by Global Footprint Network, Prof. Pires emphasized that cod and tuna, which are two of the most consumed fishes in Portugal, are also among the fishes with the highest Ecological Footprint per kcal. A shift away from animal proteins in favor of a plant-based diet rich in vegetables, cereals, and legumes, could help the city reduce its overall Ecological Footprint by 10%-19%. At 0.17 gha per person, Gaia’s biocapacity is one of the lowest among the six municipalities involved in the study (87% lower than the national average value of 1.28 gha per person). Vila Nova de Gaia’s Overshoot Day is June 3. The Ecological Footprint could help inform SDGs 2, 3, 7, 11, 12, 13, and 15. An animated debate ensued, focusing on issues such as tourism (which affect sectors such as transportation that impact the Footprint of the municipality) and the accuracy with which the Footprint method can track it; commuting trends across the wider metropolitan area of Porto; ways in which local biocapacity can be maintained or increased; last but not least, electricity production and consumption. The city administration has already engaged in projects to retrofit social housing with energy efficiency features. The need to rethink local policies in light of the high contribution of dietary preferences to the municipality’s Ecological Footprint merely reflects the need for national guidelines on sustainable food, along the lines of the National Program for the Promotion of Healthy Eating (PNPAS). From left to right: Sara Moreno Pires, Alessandro Galli, Arch. Valentim Miranda, and Paulo Magalhães.